To Sum It Up: With magic forbidden in Ixia and anyone with the ability to use it marked for death, Yelena has very little choice but to seek refuge in her homeland of Sitia. Although she is reunited with the family she was taken from as a child, she also finds herself separated from her Ixian friends—and from Valek. Sitia is the only place where Yelena can learn to control her magic before its power overwhelms her, though, plus it appears that only she may be able to stop a killer from claiming another victim. Review: My feelings toward Magic Study, as well as the next book in the series, Fire Study, are a little jumbled. On the one hand, I didn’t think either of them quite captured the brilliance of Poison Study when I initially read them three years ago, and I’m still of that opinion regarding Magic Study. I will say that I did enjoy reading it again, and knowing what to expect actually made me appreciate the book a bit more the second time around, just not to the degree that I love Poison Study. One of the most noteworthy changes from the first book is the setting. Since being a magician in Ixia carries a death sentence, Yelena returns to her birthplace of Sitia, where she’s reunited with the family she’s been separated from for years. Here’s a perfect example of the advantage of having read this before: I couldn’t stand Yelena’s brother, Leif, when I first met him. He’s so mean to Yelena! Fortunately for Leif, I know that he moves past acting like a jerk to his sister and becomes a rather affable character down the road. While I did yearn for the good old days in Ixia as I reread Magic Study, I also had to give Maria V. Snyder a lot of credit for expanding the world and really delving into the magic that was touched upon in Poison Study. I do miss Yelena the food taster, but there’s something compelling about Yelena the Soulfinder as well. Snyder is such an adept storyteller, and even though I think this chapter in Yelena’s adventures could have been chronicled in a few less pages, I nonetheless found myself immersed in the details of Sitian politics and life at the Citadel, where young magicians learn to master their skills. 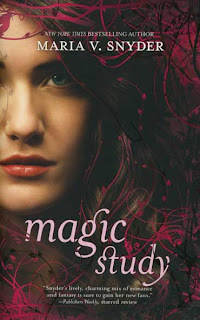 Magic Study introduces several new characters in addition to Yelena’s parents and brother, including the other three Master Magicians (Fourth Magician Irys Jewelrose having been introduced in Poison Study), the very annoying Cahil, who claims to be the heir to the Ixian throne, Yelena’s beloved horse, Kiki, and the mysterious but cool Moon Man. The newcomers were welcome (well, except for Cahil), but it was impossible not to miss Yelena’s Ixian buddies Ari and Janco and, to me, the most important figure from book one: Valek. Valek and Yelena’s slow burn of a romance was everything in Poison Study, and his absence for most of Magic Study is fiercely felt. He’s just so integral to the series, and his scaled down presence here is my biggest quibble with the book. While there’s enough novelty to Magic Study, like the new locale and the deeper exploration of magic, to move the story forward and keep it interesting, at the same time, it’s tough to ignore the lack of Valek awesomeness for almost three hundred pages. Then again, it was the promise of Valek’s reappearance, even during a reread, that kept me turning the pages with gusto. All in All: Magic Study delivers on the magic part of its title as we follow Yelena’s training and witness the breadth of her powers. This novel would have been even better with more Valek, obviously, but I suppose some Valek is preferable to no Valek at all. Tsk. I'm not liking you much right now. You're this close to making me add 4 FRICKING BOOKS to my TBR just to get to Shadow Study! Grrr! This sounds like an awesome book! I'll have to try this out! I'm glad that you enjoyed this one - despite it not quite living up to the first book. Your issues with this one aren't making me want to read the series any less, but it's still a shame when a sequel fails to live up to it's predecessor. The main issue here seems to be the lack of beloved characters from the first book and I can see myself feeling the loss as strongly as you do. That slow burn romance is making me crave it and then well, to go without seems a bit cruel heh! It was cruel! Ally would definitely agree with me- she read the series before I did and I remember her flipping through this one to see when Valek would show up again, lol. I'm glad you're still willing to give the series a shot; I think it's worth reading all the way through, even though to me, the first book is the best.